Heat oven to 350°F. 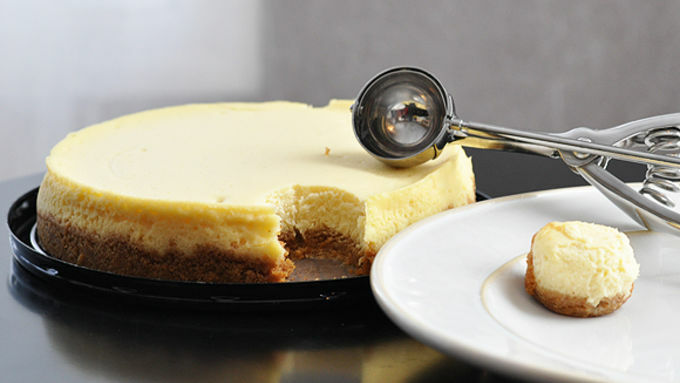 With a 1-1/4 inch cookie scoop or spoon, scoop cheesecake into 24 balls. Set aside. Place paper baking cup in each of 24 regular-size muffin cups. 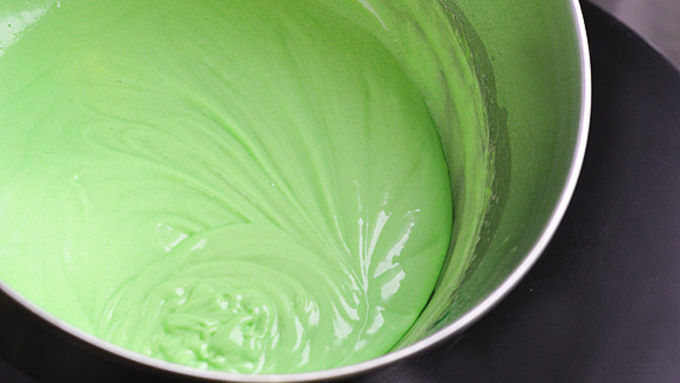 In large bowl, beat cake mix and gelatin with electric mixer on low speed 30 seconds. Add remaining cupcake ingredients (NOT cheesecake). Beat with electric mixer on low speed 30 seconds; beat on medium speed 2 minutes, scraping bowl as necessary. Divide batter in half. Divide the first half of the batter evenly between the 24 cups. 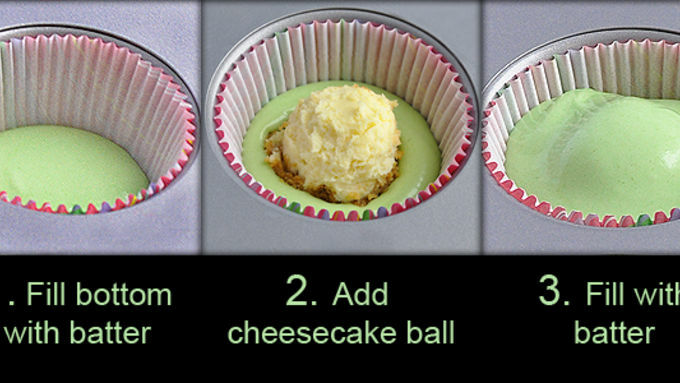 Add one cheesecake ball to the center of each of the cups. With the remaining half of the batter, cover the cheesecake balls, dividing the batter evenly between the 24 cups. Bake 15 to 20 minutes --just until top of cupcake springs back to the touch. Remove cupcakes from pan and cool completely on a rack. In small bowl, mix the frosting, yogurt, Key lime juice and powdered sugar until a thin consistency. Tip cupcakes upside down and dip tops into the icing mixture. (There will be leftover frosting.) Garnish with sprinkles, Key lime slices or grated lime peel. Serve immediately. Cut cupcakes in half to expose cheesecake centers, and place in a small bowl. Drizzle with a liberal amount of icing mixture and top with ice cream or whipped cream. Garnish with Key lime slices or grated lime peel as desired. 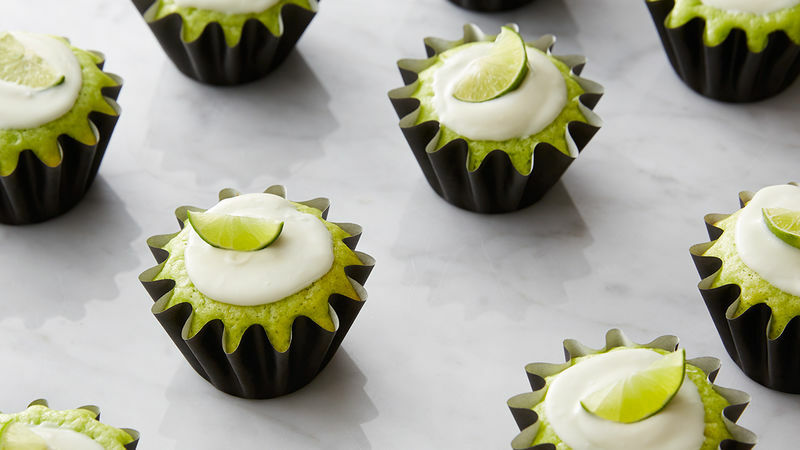 Just when you thought you and your SO were the perfect pair, along comes Key lime and cheesecake -- together in one cupcake! Your brain is wanting spring. Your body is wanting spring. But here we are stuck smack dab in the belly of February -- not quite winter, not yet spring. What's a person to do? Bake up something refreshing and indulgent, that's what. And this pair -- tart Key lime cakes stuffed with sweetly creamy cheesecake -- will shake up your day and turn it from drab to dramatic. But wait! Isn't cheesecake kinda finicky? A bit temperamental? Yah, it is. 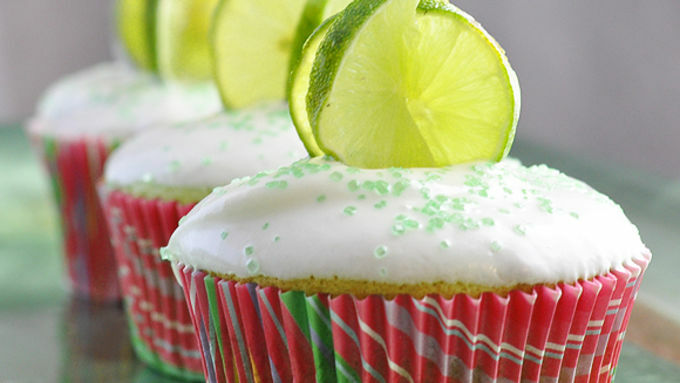 So that's why we're not going to make the cheesecake to stuff into these Key Lime Cheesecake Cupcakes. Easy! Then garnish with slices of Key lime, cut to the center and interlocked for this 3D decorator effect. So there you have it -- a perfectly awesome way to beat those mid-winter blahs into submission! Serve the cupcakes cut in half, open-face, so you can see the secret cheesecake inside, with more of the icing mixture drizzled over the top. Finish with whipped cream and a slice of Key lime. Can't get enough cupcakes? Neither can we, that's why we have these amazing cupcake recipes ready for any occasion.